A product liability claim was filed against 3M Company in Texas in late January over the “Combat Arms” earplugs that were issued to U.S. military veterans between 2002 and 2013, alleging that the company’s defective design and manufacture and failure to warn users or provide proper instructions with the product resulted in harm to users; specifically, tinnitus, hearing loss, and loss of balance. The earplug devices—called “dual-ended Combat Arms”—were issued to military members while they were stationed either domestically or abroad. Originally developed by Aearo Technologies, which was later acquired by 3M, plaintiffs claim that both companies were aware of the defects long before they were provided to the military. The defect, they claim, is based on the earplug stem being too short, which makes it difficult to properly insert the plug into the ear, causing it to loosen and allow sounds to enter the ear canal. Plaintiffs are now suing for loss of earning capacity and wages, medical expenses, mental anguish, pain and suffering, physical disfigurement and impairment. Reportedly, 3M previously agreed to pay more than $9 million to the U.S. government last year to settle allegations that it knowingly sold the Combat Arms Version 2 (CAEv2) earplugs to the military without notifying them of the defects. As part of that settlement, they did not admit any guilt or liability. The settlement was in response to a lawsuit filed under the whistleblower provisions of the False Claims Act, whereby the U.S. alleged that both 3M and Aearo Technologies, Inc. knew that the plugs were too short, could loosen, and would thus not perform as they were intended to. The Act allows private parties to sue on behalf of the government if they believe that a defendant submitted false claims to share in the recovery of damages. Still, according to the U.S. Department of Veterans Affairs, 52 percent of combat soldiers, or close to 3 million veterans, in general return to the U.S. with severe hearing loss and have to receive disability benefits for tinnitus or hearing loss; regardless of whether they used these particular earplugs. According to 3M, the ear plugs are not the direct cause of the injury, and the company previously settled just to avoid getting involved in litigation with the U.S. military. 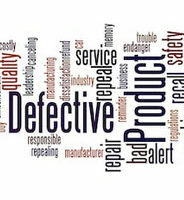 Manufacturers who are sued for product liability claims need to have qualified defense representation. This is not only the case if you plan to go to court, but if you plan to enter a settlement agreement, which can have its own repercussions on companies, particularly when it comes to additional parties bringing suit. Our Texas product liability attorneys provide skillful representation to Texas companies facing these claims. Contact us today at Colvin, Saenz, Rodriguez & Kennamer, L.L.P. to find out more.